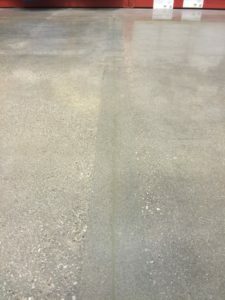 During the life of an industrial concrete surface at some point will show signs of wear and tear. The areas that we see the most destruction are the construction and contraction joints. These joints take the abuse from large amounts of both heavy forklift traffic and commercial vehicles. These necessary joints that allow sections of the slab to expand and contract have a life span that is limited based on how much traffic they encounter. Once the joint shows it’s first sign of damage, it only becomes worse with every pass. USA Renovations offers one of the industry’s best repair procedures by leaving the joint section in the concrete restored and stronger. Curing time is fast and repair will outlast the prior joint. 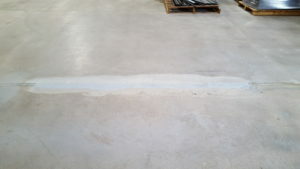 During the process, we check for uneven slabs that meet at the construction joint. If necessary our mechanical concrete grinders will grind down and feather in a smooth transition allowing traffic to pass with ease. This will increase efficiency and reduce the chances of damages later. To get started on the repair of these sections, we first observe the scope of work by collecting measurements and performing tests. This allows us to ensure that our field crew will have all necessary tools and products to get the job done. 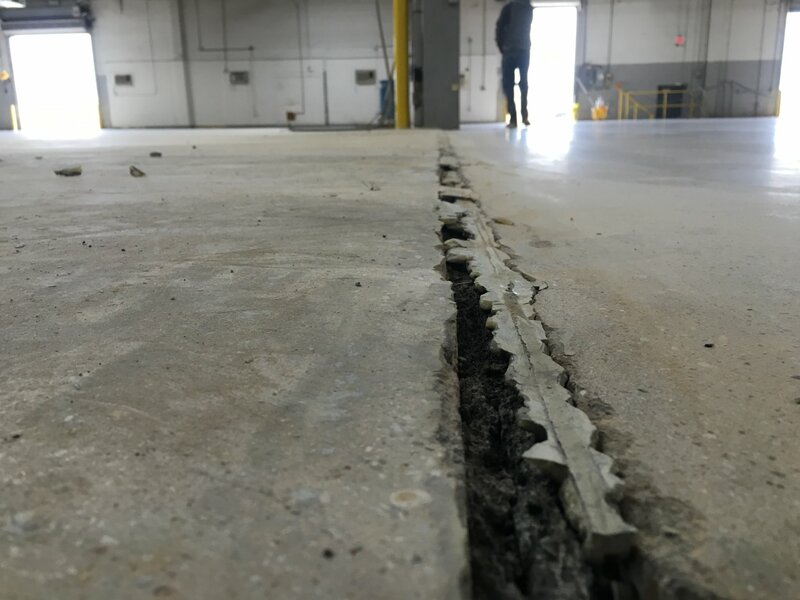 We measure the thickness of the slab, the width of the repair section and scanning the surrounding areas for unleveled slabs at the joint line. First, the demolition of the join section begins. 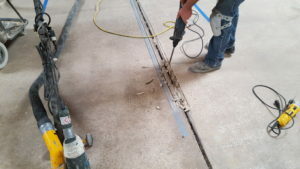 Our team will remove 1 – 3 inches on both sides of the joint sections and cut a depth between 1” – 2” for a sound repair. All loose particles will be removed with remaining debris using with our HEPA vacuums. 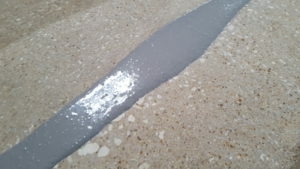 After mixing the three part system comprised of resin, activator, and grit, we install to full depth. During the Joint Section Repair process, our team will ensure a smooth transition on either side of the joint line. This works well for slabs that are uneven. This important step in the repair process ensures heavy forklift traffic will have a smooth transition from one side to the other. Next, the product is installed. USA Renovations uses only the best products on the market. Our joint section repair product cures an impressive 10,000 PSI, making the final product a great investment. Further, the product is very customer friendly with curing time being very short. After placement, the joint section is foot traffic ready within 3 – 5 hours and heavy forklift traffic within 4 – 8 hours. The final step is to cut a new expansion joint and fill with a Polyurea or Epoxy – whichever is more suitable for the customer’s application. 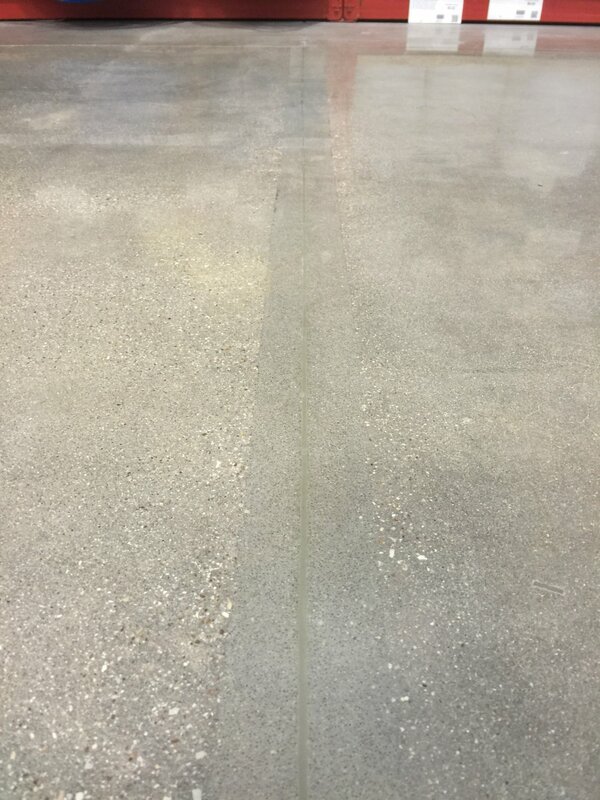 Many are unaware of the proper procedure to repair these damaged slab joints. This system is backed by USA Renovations as well as the manufacture of the products we use on the job so you can have peace of mind knowing the professionals at USA Renovations have your back.